From the 2014 year, "Garden of the heavy snow forest" of Kamikawa town joins the Hokkaido garden highway, it becomes 8 garden. Asahikawa ~ Furano ~ Tokachi's 7 Garden (Ueno Farm, Wind Garden, Tokachi Millennium Forest, Manabe Garden, Tokachi Hills, Purple Bamboo Garden, Rokka no Mori) collaborate to promote Hokkaido sightseeing "Hokkaido Garden Street ", it was decided that a new garden will be added from the 2014 year. Today, on July 1 2nd morning, the directors of the Hokkaido Garden Highway Council visited "Garden of the heavy snow forest" owned by Kamikawa Town and managed by NPO corporation Asahigaoka, and at the extraordinary general meeting from the afternoon 1 time It was approved. This time will be the first time that a garden owned by an administrative agency will join. In the 2014 year, 8 two gardens work together to further boost the Hokkaido Garden Highway. Opened on July 7th this year in Kikusui Asahigaoka, Kamikawa Town, Kamikawa-gun. Owned by Kamikawa Town, operated by NPO Asahigaoka. Ueno Farm Ueno Sand Yuki designs the "Forest Garden" area. In addition, the garden restaurant & villa "Fratello di Mikuni" of the Mikuni Seiko chef operates in the park. 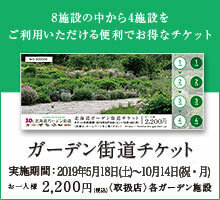 ○ Summary On July 7 (Sunday) "Great Snow Forest Garden" was born in Osakaoka Ogasawara Takahara, Kamikawa Town, a scenic spot where people who are known as the beautiful scenery of the Daisetsuyama system № 1 know. "Garden of the heavy snow forest" is composed of "Forest Garden", "Forest Guest House" area, and "Welcome Garden" and the size is 3.3ha. The "Forest Garden" open to the public this year is designed by Yuki Ueno, Gardener, composed of 5 theme gardens, about 500 varieties are planted. We cherish the plants around Daisetsuzan while gathering plants that match the climate of Hokkaido, uniqueness, and a garden filled with the richness of Kamikawa Town. I am thinking that I will slowly take time and grow up into a wonderful figure. This year, it will be released free from the fact that we are planting soon, and because construction is done around us for full disclosure next year. The "Guest House in Forest" scheduled to be released next year is made up of 13 theme gardens including a dining kitchen in the forest with a stone kettle and sink, and a garden imagining living. It is planned that there will be no other garden that is the theme of enjoying and enjoying in the forest. In addition, the center house which becomes the entrance of the garden, and the welcome garden at the front also become open, and it becomes full open. Garden information, shops, galleries, and イ ト イ カ フ ェ are placed in the center house. Also, in the garden, chef Mikuni Kiyosu, known as the master of the French world, and a chef Horikawa Hideki, who leads Hokkaido's Italian cuisine, join the garden restaurant & villa "Fraterron di Mikuni ", and the appearance of Mt. Taisetsuzan from the large window of the restaurant is a masterpiece. The villa adjacent to the rest run, the dinner at the restaurant, the system to deliver the breakfast to the room, you can stay while being surrounded by the beautiful nature as painted. ● Pictures and press releases can be downloaded from the following.